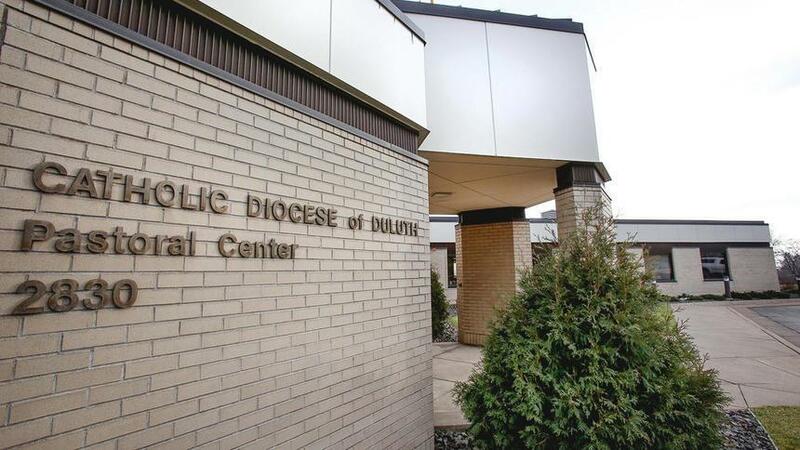 The U.S. Bankruptcy Court reported that 125 abuse claims were filed against the Diocese of Duluth, which entered Chapter 11 protection in December. A majority came in the final weeks before the deadline of the Minnesota Child Victims Act. It's been a little more than a week since the Minnesota Child Victims Act expired, bringing a close to a three-year window that provided legal recourse for victims of decades-old child sexual abuse cases. The legislation allowed hundreds of victims to come forward for the first time. It led to a whopping $4.9 million verdict in November. Both the Diocese of Duluth and the Archdiocese of St. Paul and Minneapolis cited an abundance of claims stemming from the law in filing for bankruptcy. And while the window is now closed, it could be years before the full effects of the law are seen for both victims and the Catholic Church. "Honestly, I think this is just the beginning," victims' advocate Megan Peterson said. "We have all these civil suits that have been filed, and we're going to continue to fight for the release of documents and work to expose perpetrators that have been covered up." The U.S. Bankruptcy Court reported that 125 abuse claims were filed against the Diocese of Duluth, which entered Chapter 11 protection in December. A majority came in the final weeks before the deadline. Mike Finnegan, an attorney who represents victims throughout the state, said about 1,000 claims were brought against individuals and organizations statewide. He said about 200 alleged perpetrators were identified for the first time. Other dioceses reported similar pre-deadline influxes. The Diocese of New Ulm said it received 98 claims. The Diocese of St. Cloud reported that 74 victims came forward during the three-year period. The legislation's expiration prompted Minnesota's six Catholic bishops to issue a joint statement apologizing to abuse victims. "The last three years have brought fresh light to the painful reality of sexual abuse and those who have been hurt by it," the statement read. "We, the bishops of the state of Minnesota, cannot imagine the pain those individuals and their families carry with them and the courage it takes to tell someone, 'I was abused,' and relive what happened. We apologize for their pain, and we thank them for coming forward." The Minnesota Legislature in 2013 enacted the Child Victims Act, joining a handful of other states that have opened windows for victims whose claims would otherwise be barred by the statutes of limitation. Typically, individuals have until age 24 to file suit over sexual abuse that occurred as a child. Victims' advocates argued that was insufficient, precluding many victims from coming forward because it can often take years — or decades — for an individual to overcome trauma and acknowledge abuse. Peterson, who recently moved to Superior and took over as the northern Minnesota director of the Survivors Network of those Abused by Priests, said she's encouraged by what she's seen from the legislation. "It certainly has given survivors who weren't prepared to deal with the abuse before age 24 a chance to do so," she said. "I think there's an increased sense of empowerment among the survivor community. We're breaking the cycle of abuse and insisting that we see change." Peterson said she was sexually abused as a teenager by the Rev. Joseph Jeyapaul in the Diocese of Crookston. She sued the church a few years later, settling out of court in 2011. She has gone on to advocate through SNAP at the national and international levels. Peterson said the Child Victims Act has helped younger generations feel more comfortable about coming forward with allegations. "It was after hearing other survivors' stories that I came forward," she said. "And that was before the window opened. To see survivors speaking out, I think it does have an impact on our communities." While the Catholic Church has been the main organization affected, Finnegan said the law also has helped victims who were sexually abused in groups such as the Boy Scouts and the Minneapolis-based Children's Theatre Company. "It's had a tremendous impact," said Finnegan, who works for St. Paul-based Jeff Anderson and Associates. "It's made our communities safer and it's allowed hundreds of survivors to come out of the shadows." The law, however, has come with some serious consequences for the organizations that faced dozens — or sometimes hundreds — of new claims in a short period. The Twin Cities archdiocese was the first to file for bankruptcy in January 2015, with officials saying the church could not withstand the tide of lawsuits. The Duluth diocese followed in December, weeks after a St. Paul jury awarded $4.9 million in damages to Bill Weis, who was abused by a priest in Itasca County in the 1970s. It was the first case in the state to go to trial under the Child Victims Act. Duluth Bishop Paul Sirba noted in a statement that the diocese has had a policy on clergy sexual abuse for two decades and said the safety of children is a "chief committment." "The past three years have allowed many victims of clergy sexual abuse to come forward who had not previously done so," he said. "Even a single victim would be one too many, so to know that more than 100 have come forward in our diocese after all these decades is heartbreaking. And there are others who, for a variety of reasons, have not come forward. Each of these individuals also represents many loved ones who have suffered with them. I am so sorry for your suffering." The state's six bishops also reaffirmed a commitment to working with law enforcement and continuing "stringent hiring standards, background checks for employees and volunteers who interact with children, and specialized training for employees and volunteers to make sure they are able to recognize the signs that might suggest that young people are at risk or in danger." Duluth Vicar General James Bissonette said in an earlier interview with the News Tribune that bankruptcy was the only option to ensure essential church services continue while also providing relief for victims. "We've tried to put victims first and seek the truth with transparency and do things in the right way," he said. "Going forward now, we're going to make sure victims share in a measure of justice." For the 125 claimants in the Diocese of Duluth, the case now hinges on mediation. Discussions are expected to begin July 19 in Minneapolis. The diocese and representatives of the victims agreed to work with Gregg Zive, a federal bankruptcy judge in Arizona with experience mediating diocesan bankruptcy cases. Finnegan, whose firm represents 118 of the claimants, said he'll continue to push for the release of the diocese's files on each accused priest. "The goal is to make sure that all perpetrators and institutions are held accountable, that justice is done here," he said. "A big component of that is to make sure that there are no more secrets." Document releases have typically been included in bankruptcy settlements, but diocese officials have not specifically addressed potential terms of any future agreement. The Diocese of Duluth is the 15th diocese or religious order nationwide to file for bankruptcy. All previous cases have resulted in some form of settlement. Peterson said there is still substantial work to be done in Minnesota and beyond. She said there are many perpetrators who remain unknown to the public and organizations that continue to protect child abusers. "The Child Victims Act is really giving us an opportunity to protect our communities," she said. "I hope the communities in this region can recognize the courage of survivors and thank them someday. This is not easy work, and they are protecting future generations from the same kind of abuse they went through." Meanwhile, Sirba said he encourages any other victims to come forward — even if there is no legal recourse available. "We will continue to offer victims our support, our prayers and whatever help we can," he said.